A community of the arts presents A Christmas Carol! Home » About » News » A community of the arts presents A Christmas Carol! What a productive weekend it was for the North Country Center for the Arts (NCCA) and Jean’s Playhouse! Thanks to Chief Mellet and the Woodstock Fire Department, Jean’s community theatre has plenty of supplies to build their sets for the Christmas Carol this winter. Chief Mellet opened the doors to the old Woodstock Fire Department Saturday morning where there was an abundance of old sets and materials from the local haunted hayride. 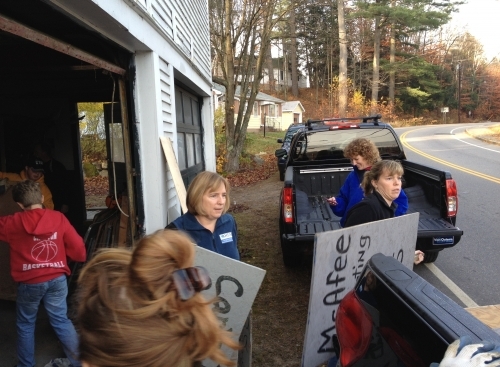 Many of Jean’s valued community theatre members gathered together Saturday morning with trucks and began to transport many of these materials over to the workshop at the newly constructed Jean’s Playhouse. The sets will be re-furbished and used in the upcoming season of the Christmas Carol! A special thanks to Polimeno Realty and Arnolds’ Auto Center as their trucks along with many others were fundamental in the move of these large sets and materials. The cast of the Christmas Carol will range from all ages and the show will run from November 30th – December 16th each Friday and Saturday starting at 7:30PM with a Matinee on Sundays at 2:00PM. We are so very excited to present our first community theatre show at Jean’s Playhouse and look forward to many many more! Thanks to Arnolds’ for use of their truck!